Found this while on Manchester Place, the week before Garden Walk last year. A beautiful rock garden, complete with artwork, occupying a hell strip (the area between sidewalk and road). I don’t think I’ve ever seen a nicer one. This is a favorite old post, created before I was on Blogger. I repeat it here to save & catalog it on this new site. I agree- that is exceptional! I love the use of rocks in this area- keeps everything neat and sturdy. Wow! Any gardener could get some ideas from this strip! Thanks for showing it to us! I like hellstrip better than most other descriptions of this particular part of urban yards. Between, snow, slat, dogs & human traffic, it's a hell of a place to plant anything. And the rocks pretty much stay in place over winter I'm told. Set a table top on the stump? It's an opportunity for your creativity. It is beautiful. The rocks and the planting used work so well. And adding some garden decor to it adds that extra touch. I hope no one steals the stuff. Great use of what could be an unsightly area. Jim, I don't know how that stump looks, maybe it is as ugly as a rotten tooth, but if not - did you consider using it, planting something in it, for example? Very creative - I love the title of your post! I'm not quite sure what the stump looks like myself. They cut it down in the snow! And I haven't had a good look at it since. Not sure I want to plant something in it if they are going to grind it out. Thanks. These are the things that keep me up at night. Cool, isn't it? Good solution for all the shade it gets under that tree. That's a nice treatment, and the stones will help give it interest in winter too. This hellstrip has the advantage of having a sidewalk between it and the street. It seems like most of Austin's hellstrips are right next to the street, which means your planting gets stepped on by people parking along the curb. There was definitely a lot of time and effort in that garden. Looks nice! Yeah, they do have that narrow strip between road & garden. I think I would add a strip of pavers or something similar when I do my own for the people that need to get out of cars. That is a fantastic planting for a streetscape there, Jim. I always called these spaces "street yards." The designer first raised up the area with the rocks, allowing backfill to be added and subsequently much better drainage for the plants. 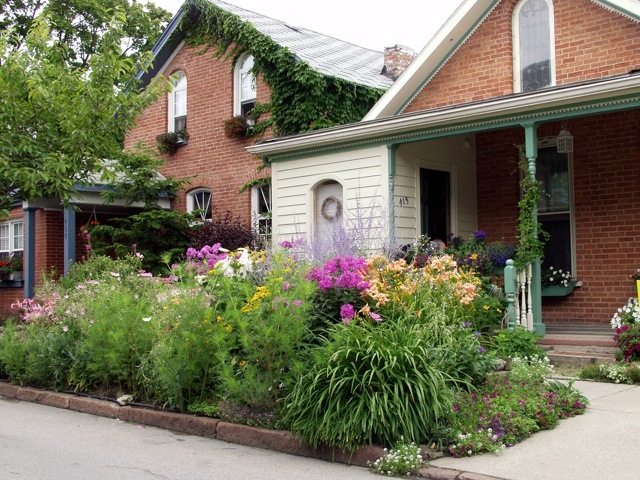 Most streetyards have been trampled, making the soil very compacted and unfriendly to plant growth. 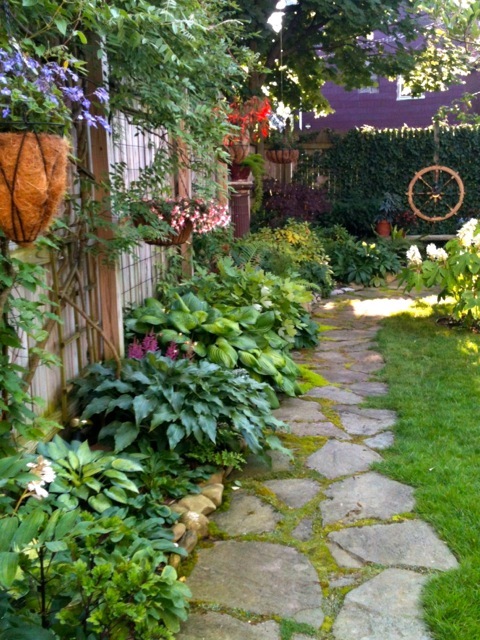 He/she then added a nice mix of low-growing perennials with a few annuals tucked in for effect including the spike plant, wandering jew and purple heart (tradescantia). As Pam noted above, the added concrete strip adjacent to the planter and the curb, keeps the car doors from decapitating the plants and allows passengers to enter and exit their vehicles with ease. Great idea! I always just called them "boulevards", and that was for lack of another - better - term. (Which I am not sure I have, lol). I will say the title is appropriate, however. Dogs would bother me most. This is a really great blog, Jim. It teems with information and irreverence (a particular fancy here) which is an under rated quality. You have fun yet inform and interest. Great combo! I am delighted to have found you! Pam, Your diagnosis seems to be correct on this "street yard." Though I do think hellstrip is a more accurate term. I'm told the stone pretty much stays in place through the winter. That'd be my greatest fear with something like this. Thank you for the kind words. 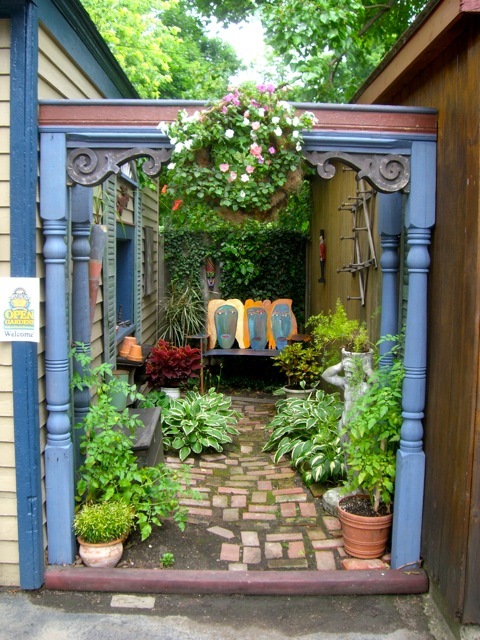 I originally started this blog to help promote Garden Walk Buffalo, and anyone can tell you I do that, but have found it fun to write and come up with ideas for posts. I'm glad you like it. Coming from a landscaper that knows of whence he speaks, it's much appreciated. We always called this area, the "tree lawn". Your blog was really amazing. I got so many tips.